The following sash balances have not been sold for fifteen years or longer: Superior, Fabco, Graves, Graves mortise, Olympic and Thin twin. 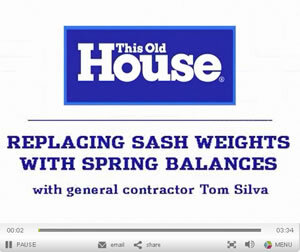 All of these sash balances can be replaced with the Acme twin. Today, people appreciate the craftsmanship and quality of original wood sash windows. Gone are the days of simply ripping out beautiful old wood windows and replacing them with aluminum or plastic windows. In fact, many communities require maintenance or replacement of original windows in older neighborhoods, in order to maintain the ambience of the streetscape. Quality wood windows can often be refurbished for less than the cost of new windows. Wood has always been a superior insulator against changing outside temperatures, but metal is not. Therefore, many are refitting old windows with new window sashes or double-pane glass to decrease the heat loss in winter, and keep the heat out during the summer. Sunscreen for glass is also available today. One alteration that is often overlooked when windows are refitted is the process of adjusti0ng the weights to “carry” the increased weight of the new sash glass. Under sizing the balance can cause injury, if the sash falls onto an unsuspecting hand. For hundreds of years (up to the 1960’s) sash window balances were popular, because without air conditioning, opening the top and the bottom sashes provided a convection air-flow that brought cooler air in through the bottom, while allowing warmer air to escape at the top. Today, with high-energy costs, this principle still works in areas where the evening air cools, compared to the daily high temperatures. This practical application, along with the resurgence of home designs that duplicate our older classic homes, has been responsible for the resurgence in popularity of the double-hung window. Prior to the 1920’s, homes generally used pulley and weight systems to balance the window sash. The weight was typically lead or brick, and was slightly heavier than the sash. Old cotton ropes, with plenty of use, might need to be replaced every twenty years or so. The cotton rope was attached to the weight behind the window frame molding, and was fed up through a pulley in the frame, then back down to the window. To repair the ropes, some windows have a slot to get access to the weight. If no access slot was provided, the interior (or exterior in some cases) window molding must be removed to gain access to the weight. Using a sharp knife or razor, cut the paint along the seams of the molding to prevent further paint damage. 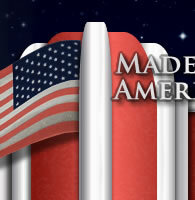 Carefully remove the molding on both sides. Access the space in the wall where the weight is and retrieve it. Cut the old rope from the weight and window sash and remove it, taking care to notice how the weight was attached to the rope. Note: Some knots should be duplicated, and some have another pulley on the weight with the rope attachment in another place. Replace the rope with a very similar thickness of rope (using a different weight of rope can cause the rope to jump the pulley). However, rope with nylon blend may not need to be replaced as often, so shop for rope that looks the same, as the old rope but has more strength due to new material development. Replace the moldings, fill cracks and paint. You will probably not need to do this again in your lifetime. First, remove the sash and weigh it. 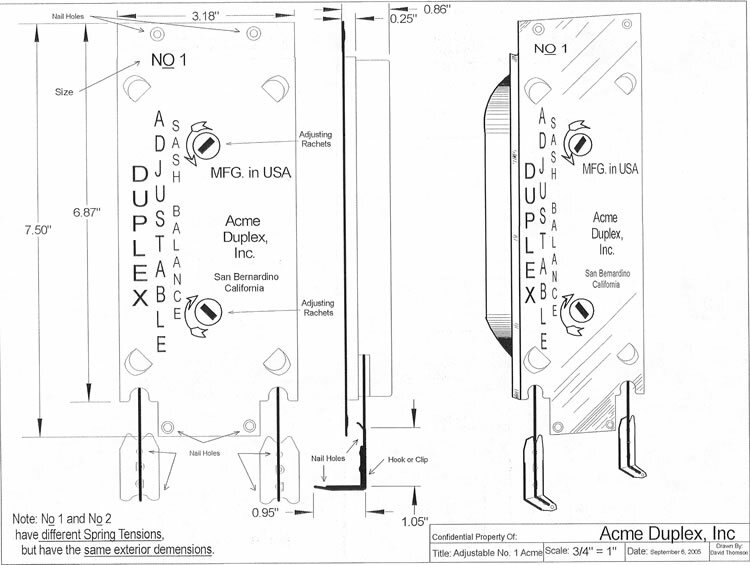 Select the proper ACME® mortise weight size, and add a few pounds for safety (see sizing charts). Each side carries half of the weight, so divide the weight by two to get the weight for each balance. Remove the pulley from the mortised slot in the window frame. Compare the ACME® mortise with the slot, remove any additional material with a hammer and chisel or drill and bit. See video for an example. When the ACME® mortise balances are securely fit and screwed to the frame, pull the tape out of one side and attach the tape to the window with the included hook. Take extreme care not to “snap” or let go of the tape as it may damage the internal spring. Do the same with the other side. Set the sash in the window and replace stop molding and touch-up paint. 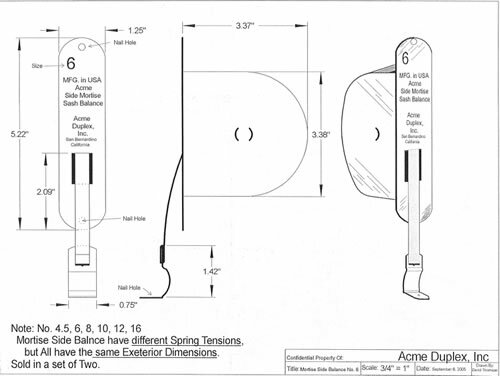 The ACME® double-hung window spring mortise balance will provide many decades of service, and preserve the look and feel of your historic windows. * Note: some choose to insulate this area when it has been vacated; however, this require removing internal or external window casing or trim.